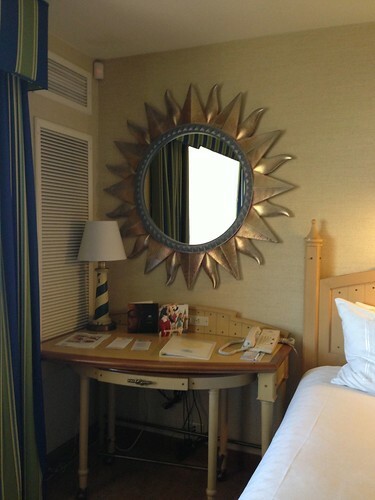 This week, my mom and I took the two year old to stay at the third of the Disney Resort Hotels - the Paradise Pier Hotel! We began our journey last spring with a stay at the Grand Californian, followed it up in the fall with a stay at the Disneyland Hotel, and capped it off with a stay at the Pier. This time, because it was off season and we were able to get a great discount with our Annual Pass, we decided to splurge for a park view room as well as Concierge, and it was well worth it! The check-in process here was probably the easiest of the three, though again it was the middle of the week in January and very quiet. Our room was already ready at 12:30, and the desk clerk was extremely gracious, made sure we were aware of the Concierge club on the 2nd floor, the services we received, early entry, etc - he even made my two year old's day with a balloon! We pulled our luggage out of the car out front and then parked it in the garage right there - easiest parking and unloading as well. The Grand had great checkin as well, but the self parking was across the street, so this one was probably the most convenient overall. Our room was on the 14th floor and fantastic - the view was outstanding, gave us a clear shot of Cars Land, the Pier, all of DCA. It was especially fun at night, as we were able to watch the World of Color and listen to the music on our TV! 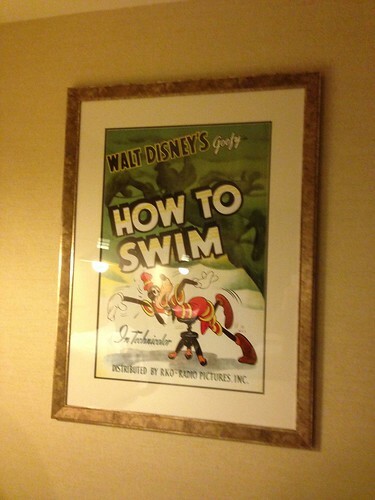 This perk is available in all the hotels, but only certain rooms have views of the show. If we were there on a fireworks night, we could get the music for those piped in while we watched as well. Very cool!! My son just sat in awe in front of the window half of the time! 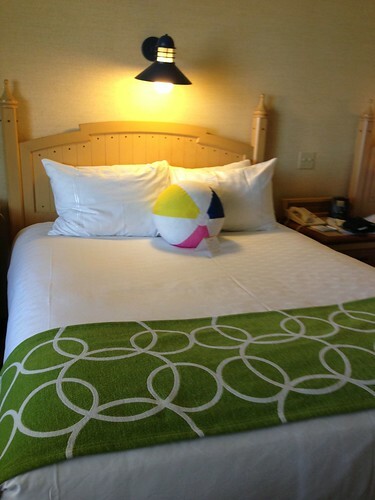 The room itself was simple but cute - beach decor, including beach ball pillows (which you can buy for $65, wow!) 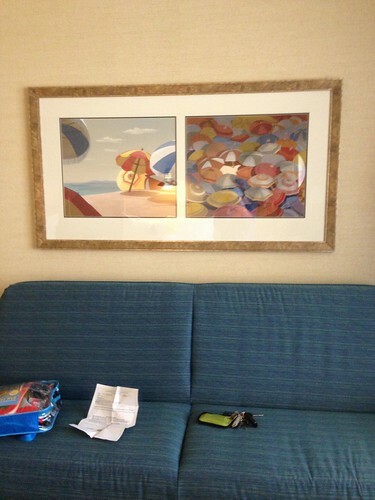 , a futon pull out bed plus our two queens, Goofy surfing on the wall, etc. As with the other hotels, a pack n play was included in the closet, along with soaps, shampoos, etc. The room did adjoin the one next door, which could be very convenient if you were traveling with a large family or families and wanted the Disney experience with more space. 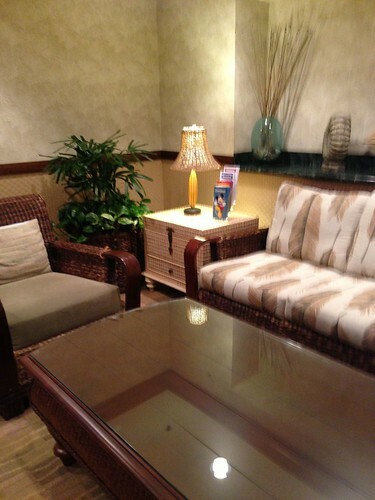 The treat of the stay was the Beach Cabana Club, which is the private lounge on the second floor for Concierge users. It should be noted that the price of this trip cost us no more if not less than our Disneyland Hotel stay in October (regular room which was upgraded to pool-view) and definitely less than our stay at the Grand (again regular room upgraded to pool view), and it included a park view PLUS the concierge services. While the other two hotels definitely have their own unique perks, this one is by far the best "value" and best option for a family going on a budget, especially for what is included. The Concierge services included a continental breakfast in the morning (pastries, cereal, coffee, espresso, fruit), snacks all day long (chips, fruit, sodas, milk, coffee, juice), happy hour in the evening (one hot dish that changed each night, cheese/crackers, bread, wine/beer, PB&J sandwiches for kids, drinks) and dessert in the evenings (chocolate covered strawberries, cookies, etc.) Needless to say, we only ate in the park once and that was after we checked out - this was more than enough food to cover us throughout the day, and the happy hour food was sufficient for dinner as it's "all you can eat." We felt we made back a lot of the money we spent on concierge by what we saved on food in the parks. It was really a great deal! The service was oustanding, the waitress and Cast Members remember you by name. In addition, the lounge always has a Disney movie playing, and you can check out DVDs to watch in your room, which we did both nights - the Cast Member catalogs them on an iPad, which is pretty cool, and it's a simple process of leaving your room number. You can also check out board games or use the computer in there, so it's very convenient and makes the hotel stay into more of an apartment like experience. 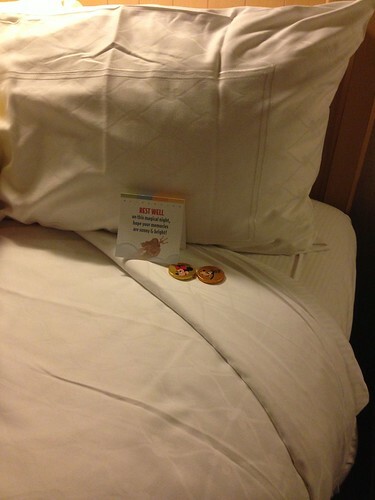 Not to mention back in our room, we were left chocolate covered Mickey Rice Krispy treats, as well as turn down service with chocolates every night! We felt like Royalty and overall it was such a great experience! Rice Krispie Treats & Strawberries! As far as other amenities, the PPH has a fitness room, pool, hot tub, and water slide. It was freezing and not swimming weather, but those are all located on the 4th floor roof. 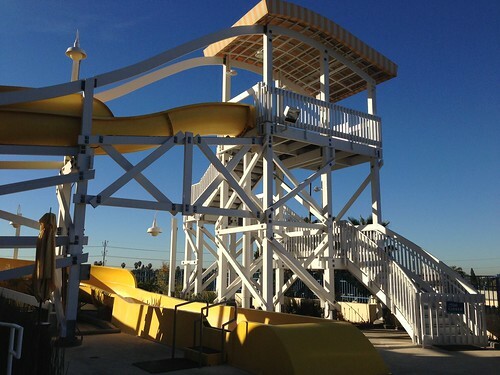 The pool has been redone and the slide added since I last stayed there in 2008, and gives it more of a Resort feel. The Disneyland Hotel still wins for best pool area (can't top monorail slides) but this one is definitely an improvement from what it used to be. In the lobby area, there is also a movie room with beach chairs for the kids, and an arcade that my son had fun in for a few while we awaited breakfast. The hotel also offers meeting rooms and conference services. Thanks so much for this review! The photos are great! I am so glad you guys enjoyed your stay. I will say again how underrated I think the PPH is. Thanks again for the great report! My wife and I would love to come back and stay at the pier but for for 3 nights, flights, and tickets to get in it gets a bit spendy. Any ideas on how we can save. Excellent review! My family loves PPH and we always stay concierge theme park view. I agree this is an excellent value, especially if you plan ahead and look for special rates. The concierge rooms also seem a little larger which is great for my family of 5. Another great experience we have had is the surprise upgrade to a family suite (with theme park view) this has happened to us 5 times. We have stayed at The Grand & DLH many, many times over the last 17 years and have never received any type of upgrade. We only been staying at PPH the last 5 years, and as I said we have been upgraded to suites 5 times. The concierge staff is always so friendly and helpful, I'm always amazed they remember your name so quickly. Our next stay will be in June and we can hardly wait. Thanks again for such an excellent, comprehensive review! Hi! We are staying at PPH for our first time in July. We have stayed at both the DLH and The Grand so we are looking forward to completing the triad and deciding which was our favorite for our next stay. The concierge service sounds great! Do you think guests only get surprise upgrades when they have the concierge service? Just arrived after a long day of flight and getting a bit lost in our rental car. When we pulled up, the 2 CMs that met us were very friendly and helpful. We went to the desk to see if there was any way to get an early check-in (we arrived about 12:30pm. They searched and were able to accomodate the 5 of us right away. The CM at the desk (I think his name was Edwardo) was totally AWESOME! Kudos to the staff here. Can't wait for the next 7 nights here, especially since this is our first time staying at the resort. any idea what the AP discount is?? What are the concierge lounge hours? 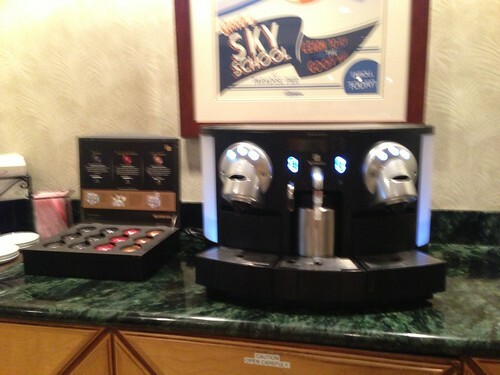 The concierge lounge hours are 6:30 am to 10:00 pm. I have stayed at the Pier years and years ago and looking forward to staying this October. After reading these rave reviews I think I will call to see if we can upgrade to the park view room at least. thank you for the great information!! Awesome detailed review, thanks! How long of a walk to Disneyland park is it? We are currently staying at a good neighbor hotel across the street, for our upcoming trip in October, but were thinking of switching to the Paradise Pier, depending on the walking distance. We just stayed at the pier for three nights and four full days. Thank you for you review it did help us to upgrade to the concierge floor. It was $110 per night and was not on the park view side. We checked in at 8am and they did give us access to the lounge then which was nice since our kids were asleep on our drive up. Breakfast consists of bagels, small croissant assortment treats, cereal, fruit, and oatmeal. We did find out on out last day that we could have asked for yogurt. Oj, milk. water, cranberry juice and a fridge with coke, diet coke, juice boxes. (Water and fridge items were available all day) I was bummed that they did not have a little something else. But overall it was nice. During the day they had cookies (the snicker doodle were amazing!) Chips, goldfish, trail mix, and another cracker type mix. We also asked for bottles of water to take with us so we did not have to buy any at the park. Happy hour (which was dinner) had a couple of different cheeses, fruit, veggies and dip, cookies, chips and salsa, uncrustables and then the main item changed from mini quiches (which would have been nice for breakfast) and mini southwest rolls (these were too spicy for my family). The happy hour was from 5-7. And promptly at 7 they take away all of trays even if there is a lot left and guests are still eating. They also always had hot water for tea, coffee, and hot chocolate. We checked out a couple of movies and enjoyed a game as well. We saw about five different cm's working the desk in there and only one lady was friendly and called us by our names even though they had all seen us many times throughout the day. The cm in charge of the food/clean up was ad sweet as can be though. The room was very clean and did have a mini fridge. 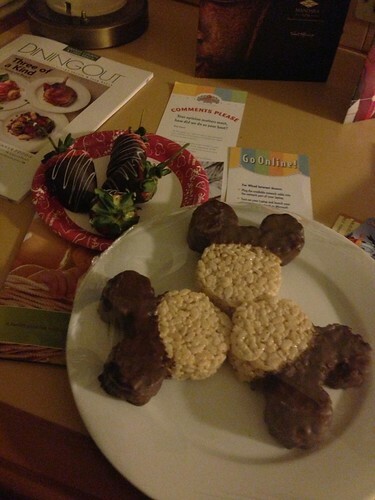 The first night we received our rice krispies Mickey's that were delicious!! Every other night had a small piece of dark chocolate. The elevators were quick, I had read some reviews that they were slow. The hotel was not as close to the parks as we were led to believe by our travel agent. We had to walk through the grand California or downtown Disney. The grad had golf carts driving some guests around and I thought that would be a great extra for the concierge guests at the pier to have. Overall we had a good experience. For the extra upgrade we would have liked a little better service and maybe and little more "extras". Does the Paradise Pier have blow dryers in their rooms? We leave in a little over a week and I'm making my "to pack" list. Thank you! Was there some sort of discount I'm not seeing for PPH? The totals I'm seeing per night are like $280+ per night. =(. Thanks in advance! the difference in price for the upgrade in rooms was 110. not the total cost of the room. Ohhhh gotcha! I was thinking I was being jipped lol thanks! thanks Disneyfamof4 and Admin DIO. My wife and I will definitely be going concierge level! great info, much appreciated!